Cumbria is a large county in North West England and contains the Lake District and Lake District National Park. It is bounded to the north by the Scottish Borders, Dumfries and Galloway, to the west by the Irish Sea, to the south by Lancashire, to the south east by North Yorkshire, and to the east by County Durham and Northumberland. Cumbria is very mountainous containing every peak in England over 3,000ft above sea level with Scafell Pike being England’s highest mountain at 978 metres (3,209ft). Cumbria is also one of England’s most outstanding areas of natural beauty attracting mountain climbers, hikers and walkers, cyclists, runners and tourists from all over the world and holds a source of inspiration for artists, writers and musicians. Cumbria consists of six districts Eden, Carlisle, Allerdale, Copeland, South Lakeland and Barrow-in-Furness. Sedbergh is a small town in Cumbria but sits just within the Yorkshire Dales National Park. Sedbergh lies at the foot of the Howgill Fells on the north bank of the River Rawthey which joins the River Lune about 2 miles south of the town. The hills can be seen rising behind the houses from all angles and its narrow main street is lined with shops. Sedbergh’s church dedicated to St Andrew dates from the 12th century and there are the remains of a motte and bailey castle believed to date from Saxon times. Sedbergh’s main industries were farming and the production of woollen garments. Wool was taken to mills where it was turned into yarn from which people in their homes knitted clothing, hats and socks. Sedbergh has now become England’s book town with independent bookshops and dealers who operate from the Dales and Lakes Book Centre. There are about eight book shops in the town from large too small. A Book Town is a small rural town or village in which second-hand antiquarian bookshops are abundant. Most Book Towns developed in villages of historic interest or scenic beauty and was devised by a book dealer and self-styled “King” of Hay-on-Wye, Richard Booth. In 1961 Hay-on-Wye became the first ever book town and there are now well over twenty of them around the world. The Howgill Fells which sit between the Lake District and the Yorkshire Dales lie between Sedbergh, Kirkby Stephen and Tebay. The fells are bounded by the River Rawthey to the east, the River Lune and the M6 to the west and the upper reaches of the River Lune to the north. The southern parts of the fells lie within the Yorkshire Dales National Park. The Calf at 676 m (2,218 ft) and Yarlside at 639m (2,096ft) are the highest hills in the Howgill Fells. Cautley Spout is England’s highest cascade waterfall above ground located just north of Sedbergh. The broken cascade of falls tumbles a total of 198m (650ft) down a cliff face at the head of a wild and bleak glacial valley that comes down from the high plateau of The Calf. At the end of the lay-by near to the Cross Keys Public House we turn left at the Cautley Spout footpath sign and cross over the bridge. We turn left and follow the path with the River Rawthey on our left. When the river bends to the left we turn right following the path along the valley following the beck on our left. At the end of the valley we start to climb very steeply uphill on the rocky and stone stepped path to the right of Cautley Spout. (There is an easier and safer path just to the right.) At the top we cross over a beck and follow the path uphill on the stone steps. We head forwards cross over a beck then keep heading forwards with Red Gill Beck on our left. Just after passing a sheep fold the beck splits into two we bear right and follow the path with the Force Gill Beck on our left until we reach the ridge at the top. (Optional: We turn right and head to the trig point on The Calf to have a quick look then return to where we came up.) We now follow the ridge path until we come to a fence and a cairn on Calders. We turn left and follow the fence for a short way and just after it bears right there are two faint paths we take the left path away from the fence. When the path splits again we take the left one uphill over the top of Great Dummacks until we come to the edge of a steep drop. We turn right and keep bearing slightly right along the top until we come to a ridge with a faint track. We follow the track steeply downhill along the ridge and when the track levels out we turn left steeply downhill making our way towards the gill on our left, we can see a farm at the bottom. We cross over a path then head down towards a second path at the fence. We turn left and cross over the gill. We go through a gate on the right and follow the path forwards through the fields until we reach the River Rawthey. We turn right crossing over the footbridge then follow the river on our right back to the lay-by and our car. This is a hard walk on grass paths and gravel tracks with steep steps uphill at the side of Cautley Spout. Elevation: approx lowest point 176.9m (580.4ft) approx highest point 675m (2,214.6ft) approx ascent 564.4m (1,852ft). Approx 6.2 miles allow 3½ to 4½ hours using OS Explorer Map OL 19, Howgill Fells & Upper Eden Valley. If parking at the car park add another 2.5 miles. Start point: Lay-by next to the Cross Keys public house on the A683. 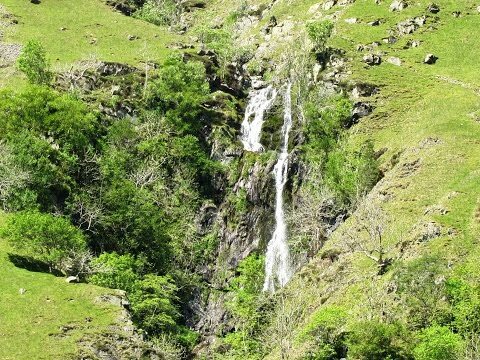 Cautley Spout is located just off the A683 approx 4.25 miles north east of Sedbergh. From the A1(M) take the A684 through Bedale, Leyburn and Hawes to Sedbergh then take a right turn onto the A683. Follow this road for just over 4.25 miles. The Cross Keys and the lay-by are on the left. Parking: free lay-by near the Cross Keys pub. There is a car park just over a mile further on. There are no public toilets the nearest ones are at Sedbergh. For refreshments there is the Cross Keys pub and nearby Sedbergh has a good selection of pubs, restaurants and cafes.